What happens when you cut government spending the way the Republicans propose? You get higher unemployment. Republicans say taxes and regulations are job killers. Wrong. Cuts in government spending like they propose are the real job killers. Here is the evidence based upon state experience. Think Progress took a look at the experience of states that have cut government spending vs. those that increased spending. The record is clear. Cutting spending kills jobs. Government SPENDING CUTS KILL JOBS. It is not hard to understand. When government spends, it creates DEMAND and demand is what creates jobs. During a recession, people and companies STOP spending. The only entity that can CREATE DEMAND in such a situation is government. When government CUTS SPENDING, the demand that was being created by government disappears as do the jobs that were being created and maintained by that spending. It IS NOT ROCKET SCIENCE, it is ECONOMICS 101. If you want to create jobs rather than kill them during an economic downturn, have the government spend, spend, spend, spend, spend……….spend until the private sector starts spending. At that point, the government can cut back and begin to deal with the deficit it has run up during the downturn due to the spending. My name is Hedley Quintana, MD and epidemiology student. However, I wasn't able to find any peer-review paper on the cut spending as explananatory variable and job creation as outcome. I also wonder which other confounders could be involved and which posible bias could you consider in your short comunication. And the value or R in your model. It was written by Adam Hersh, an economist at the Center for American Progress Action Fund. Hersh doesn't provide the R but the graph would suggest that it would be fairly strong. 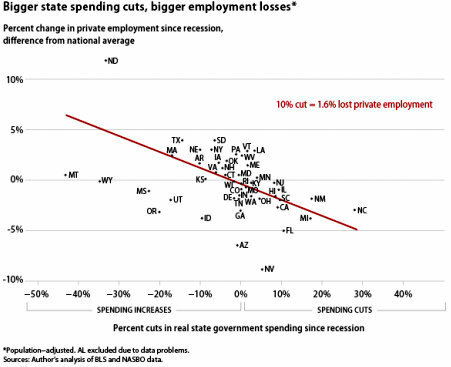 Obviously, may factors can affect job creation/loss but it would seem reasonable that spending cuts by government at any level would contribute direct (though layoffs) or indirect (through reduced state spending induced demand) to job losses rather than job gains.